Other controls: Octave select switch, calculator mode. Octave Select Switch – Using this switch you can transpose the entire keyboard up one octave or down one octave, giving the equivalent range of notes to a keyboard with 53 keys. Transposing is common on high-end keyboards, but is rarely seen on toy keyboards. Most toy keyboards are confined to very high-pitched notes, but this one can create some decent bass sounds. 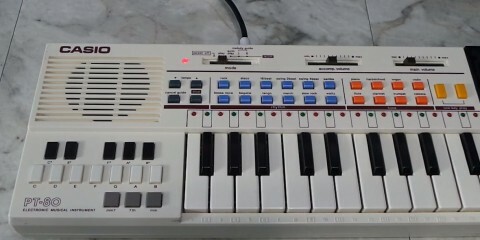 Synthesizer – While it is a pain in the rear to use, it does allow the creation of some interesting sounds, above and beyond the 5 built in sounds. Also – Be warned.. The line-out jack is only mono. Most keyboards will duplicate the sound on left and right speakers, this one doesn’t. So when recording or trying to play live, if you plug this into stereo equipment, sound will only come out of one speaker! Watch my video below for a full review. And take a listen to some music I created entirely on the VL-1.